If you or a family member are unfortunate enough to come down with head lice, you may want to think twice before reaching for the customary bottle of lice shampoo or prescription treatment from the drug store. According to the latest research the tiny blood-sucking parasites are becoming increasingly resistant to traditional methods of treatment. The problem is that the over-the-counter shampoos have used the same few chemicals since they came on the market in the mid-1980s. They worked well at first, but over time, the lice developed widespread resistance to them. In fact, 99% of lice in a recent study were found to be immune to the effects of insecticides. Pharmaceutical prescription treatments, per their own clinical studies, only show a 70% to 80% efficacy rate. In addition to being ineffective and having some possible medical risks, the shampoos and prescription treatments are costly and only delay the suffering. At The Lice Place,we get rid of lice safely, effectively, and efficiently in just one treatment – without the use of pesticides. Furthermore, the head lice education and information you will receive at any of our clinics is based upon research, clinical studies and our own 11+ years of experience. No other lice treatment company is more professional and successful in defeating head lice than The Lice Place. The Lice Place is owned and operated by a Registered Nurse. As a Registered Nurse, Penny Warner and The Lice Place team are bound by certain guidelines and practices that protect your family from potential harm. During her more than 18 years as a Registered Nurse, Penny worked as a critical care nurse, as well as Director of Patient Safety, Risk Management, Healthcare Improvement, Education, Infection Control and Accreditation Coordinator. She brings all that knowledge and experience to her lice removal business. The Lice Place started in 2006 when there were fewer than 5 lice removal companies in the US. You won’t find another service with more experience than The Lice Place. Every family that comes to one of The Lice Place clinics will have their own private treatment room (at no extra charge) – We understand that your privacy is important. The Lice Place has infection control policies in place, which ensures you will not get head lice after coming into any of our offices. Utilizing The Warner Method – a safe, non-toxic, pesticide-free method of combing and manual removal – The Lice Place has the highest publicized success rate in the country – 99.6 percent, which is backed by our hassle-free 30-day guarantee! At The Lice Place, we start AND finish the treatment. The burden is never placed on the client to “finish” the treatment at home. After all, isn’t that why you came to The Lice Place? At The Lice Place, no one plays up the “panic” mode of head lice or preys upon a person’s vulnerability during this trying time. As members of the NALTP, you can be assured we will treat your family ethically in all aspects – from treatment to billing to honoring our guarantee. No pesticides, no gimmicks, no copycats! We are THE lice removal company other companies try to duplicate. There is no need to go anywhere else but to the original – The Lice Place! 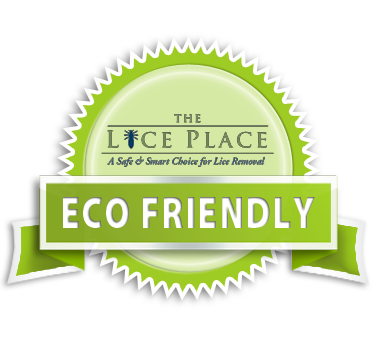 The Lice Place can safely and effectively rid your family of a head lice infestation with just one pesticide-free, non-toxic treatment. In addition, we also offer advice and guidance in preventive measures to safeguard the child and other family members from recurring cases. Our goal is to help keep your family free of lice today and in the future. After my daughter got lice from her classmates, we tried getting rid of it on our own. Unfortunately we couldn't get rid of the lice and after 3 treatments, I was very thankful to find The Lice Place. They removed the lice in one treatment and we haven't seen any lice since then! Thanks again for all your help. When I called yesterday and talked to April I was frantic. I was half way around the world working in Iraq, and was not there to help my daughter, when she needed it. April was so calm and collected and made Chloe an appointment for the same day, which her dad had to take her to. I thought between him, his mother, the school and of course ME freaking out, there is no way we can get this handled last minute in one day. Thanks to April it happened. I really appreciate all of your help during this time of need and will never forget it. Believe it or not it means more to some people than others, the every day work you do. I thought it was hard doing what I do. LOL I heard it took 2½ hours on my daughters hair and my husband was so impressed and informed when he left. We can't thank you enough. GREAT JOB!!!! I will definitely recommend your services in the future. The minute I walked in here, I knew I had come to the right place. I brought my four kids in today after a fierce battle with head lice over the weekend (I realize some people battle this for months...I can't even imagine the horror!). Your facility is a GODSEND...I actually have felt my pulse and blood pressure return to normal after visiting today. I will feel 100% better after our follow-up check later this week, but I just wanted to thank you and your staff for saving a mom from the brink of insanity. And my sweet kiddos from more torture as we frantically attacked their heads! It will be wonderful to think about something other than lice! God bless! I just wanted to email to let you know how much my family and I appreciate Nina at your Dallas location. We made an appointment today and she and one of her employees worked through myself and my 3 daughters. All have long hair and 2 had quite a few nits. This was our first exposure to lice- so we count ourselves lucky to have it hit the first time when the girls were 16 and 12. The office was extremely busy - but Nina treated us very well. She patiently, pleasantly and diligently worked through our heads to insure we were lice free when we left. Hopefully we won't be repeat customers in the future - but I will have no hesitation in referring The Lice Place to any family that may be experiencing a lice issue. OK, I cannot tell you and your staff enough THANK YOU'S. You saved my daughter and family. We were able to get in and out within 24 hours so my daughter could get back to camp. Just imagine 13 years old at camp and sent home. Penny was able to schedule us on Monday at 9am to get in. We were thrilled about the service. She was cleaned and she went back to camp the same day. She only missed 1 day. More driving to and from camp than anything. I cannot thank you and your staff enough for help, professionalism and overall kindness. The information given by your staff is up to date and very informative. The truth about Lice comes out and it is not that scary. When you and your staff explain things in a not panic frantic way, it all works out. Again I cannot thank you and your staff enough. A client and referral for life, (longer than a lice life). have literally spent hundreds and hundreds of dollars on products that don't work. If I had come here when this first started, I would have saved myself a lot of money and a lot of frustration. I just wanted to take a moment to thank you for running a wonderful company that is truly a Godsend. Unfortunately, despite being super cautious, I ended up getting lice from one of my 6 year old students, which I discovered yesterday. I frantically searched the internet for treatment options and came across your website. I called as soon as the clinic opened this morning, and I was able to get in by 11:30. Your staff took care of me, and what an amazing job they did. They helped calm my stress level and put me at ease with everything. Within an hour and a half, I was out the door and feeling much better about the situation. Thank you again for everything! I will definitely recommend you in the future! I was thrilled with the service we received. Thank you so much for starting this business and for employing such kind and professional individuals. After our family had an outbreak of lice, we were happy to find The Lice Place. They were professional and worked very quickly to get rid of the lice issue. They also gave us some great tips for removing lice from our home altogether, which worked perfectly.